So, after a rough and crazy night in Newtown, and pouring myself into bed at 3am, I was doubtful that we would get around to what we’d planned for Thursday. But, for some weird reason, we were all up around 11h00 that morning, wrestling for the bathroom. So, once we were all cleaned up and, more importantly after such a hectic night, coffeed up, we stumbled out the door and headed to the Koala Park. It wasn’t a long drive, about half a km, and when we got there, we were thrilled to see that there was virtually nobody else there. We practically had the run of the place! We had a fabulous time wandering around and seeing most of the animals the park offers. I was looking forward to seeing a real-live possum, but the best view we got was a possum's arse. He was snoozing, and no amount of coaxing could get him to show face! Incidentally, I felt like a possum's arse when I woke up! We were trudging along quietly at one stage and as we turned a bend, I saw a dingo perched up on a mound, and when he spotted us, he started to howl, which set off the rest of the pack. It was quite eerie! They’re much bigger dogs than I’d thought they were, and surprisingly, much more beautiful too. I could have stood there for hours watching them, but it always breaks my heart seeing spectacular animals fenced and caged in, so I shuffled off behind the girls and paid the birds a lot of attention. It was then that I learnt that the only wild animal Steve Irwin was afraid of was the cockatoo, which made me giggle. The rosy face of terror?? The next corner we rounded was led to a pretty awesome area of the park… the koalas! I found them totally mesmerizing when I saw ones that were awake, and wholly adorable when I was watching the little ones sleeping. Bonus points for getting to touch one!!!! I don’t know why, but I was reluctant to touch him at first… I think the uneasy feeling from the dingoes had settled in and I was just feeling a little creeped out. But, at Steph and Ash’s insistence, I relented and stepped up to tickle the little critter! I’m so glad I did, because that experience turned the dingo-creepies on their head, and I was filled with such joy! The little guy was nomming his eucalyptus branch placidly, and when I touched him, I was surprised to feel just how thick his fur was! It was like running your hands over a softer-edged, less itchy thick carpet! I gave him a good old tickle and he seemed to enjoy it, although not as much as I did, I think. I was really bummed when it was time for the next person to give it a go… I was trying to figure out how I was going to smuggle him out of the park, and country, in my handbag when his handler called the next person up. We stuck around for a few more minutes before heading to the next area… the kangaroos! The laziest buggers I’ve come across since a pride of lions! Just look at them all lying there soaking up the chilly summer sun, not a care in the world! I really enjoyed hanging out with them; they were really awesome! Higlights of that part of the day? 1) Watching a joey disappear into his mother’s pouch, right before our very eyes! David Copperfield has nothing on that little guy! 2) Scratching a kangaroo's ear while her joey was all cozy and bunty in her pouch! Eeep!! 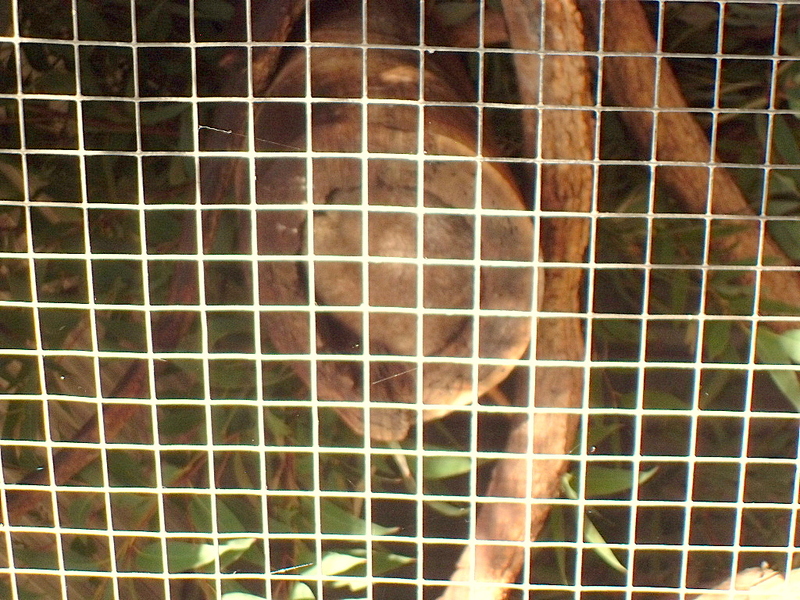 On our way out, we tried to get a good look at the sleeping wombat, but he was all “I am sleeping! Go away!”, so we gave up on that. We started feeling the ill effects of the night before and went off in search of some nourishment and recovery. We had a pretty quiet evening, punctuated by a stunning Thai dinner, and a relatively early night, because we had a huge adventure to look forward to the next day… THE CITY! That's going to be its own post, because that day (and night) turned into another crazy and random one!